WALL, NJ--(Marketwired - Apr 8, 2015) - Arthritis, which is associated with inflammation, swelling, and reduced mobility of the joints, occurs particularly often in the knee, explain New Jersey Orthopaedic surgeons John M. Tozzi, MD and Gregory J. Roehrig, MD. There are a variety of treatments available to help minimize discomfort, but when these options are not enough, many patients may wish to consider a total knee replacement to help regain full functionality and return to a better quality of life, they state. Many patients wait until the pain and loss of mobility are so severe that even basic movements are arduous, Dr. Tozzi discloses. However, he says a total knee replacement can help patients long before that point. He indicates that postponing treatment for a long time can make surgery more complicated. Acting to correct the condition while the joint is still mobile can result in more dynamic flexibility, which can ultimately lead to a significant increase in quality of life, he affirms. As a major surgical procedure, recovery from total knee replacement can be an extensive process, notes Dr. Roehrig; however, the benefits typically outweigh the short-term drawbacks, and the results may last 20 years or more. He emphasizes the most fundamental part of recovery is adherence to the rehabilitation program, which entails performing a series of exercises while guided by a physical therapist. Muscle strengthening, range of motion exercises, improved walking mechanics, and low-impact exercises can build long-term function and resilience in the knee joint, he reveals. In addition to physical therapy, the New Jersey orthopaedic surgeons advise patients to engage in low-impact exercises and avoid high-impact exercises, such as running and jumping. Total knee replacement can reduce or eliminate pain and provide an opportunity to enjoy a variety of physical activities again, they explain. Ultimately, Drs. Tozzi and Roehrig seek to provide comprehensive and transparent information for individuals considering total knee replacement due to arthritis of the knee. By developing a broad understanding of the risks, benefits, and typical healing process, the surgeons hope to create confident patients who can make well-informed decisions. Dr. Tozzi is a board-certified orthopaedic surgeon and founding member of the Orthopaedic Institute. A native of New Jersey, he relocated to New York to complete his orthopaedic residency and additional training at State University of New York, Kings County Hospital in Brooklyn. He then completed a fellowship in joint replacement/comprehensive arthritis program (CAP fellowship) at Rancho Los Amigos Hospital in Downey, CA, the largest orthopaedic rehabilitation facility in the world. Dr. Tozzi has served as the chairman of the department of orthopaedics and rehabilitation services at the Jersey Shore University Medical Center for the last 25 years. He is available for interview upon request. A graduate of Johns Hopkins University Medical School, Dr. Roehrig is a board-certified orthopaedic surgeon with a focus on joint replacement. He completed his residency at the University of Rochester/Strong Memorial Hospital and then completed a fellowship at the Insall Scott Kelly Institute for Sports Medicine and Joint Replacement. Dr. Roehrig has authored and co-authored numerous orthopaedic publications and routinely attends national educational seminars to remain knowledgeable about the latest techniques and procedures. He is available for interview upon request. For more information about Drs. 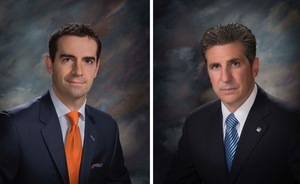 John M. Tozzi and Gregory J. Roehrig or the Orthopaedic Institute of Central Jersey, please visit orthoinstitute.com and facebook.com/OrthopaedicInstituteofCentralJersey.